Much colder weather overnight is good news for some and potentially bad news for others. 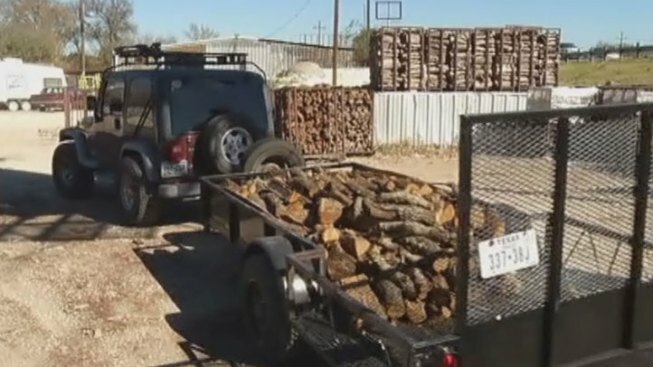 The sound of winter was evident at Big John's Wood Products on Monday as workers loaded up cords of wood for customers. "We hit our peak this time of year," said Brandon Pettijohn, Big John's operations manager. "It's what we've worked all year for. [It's] real good for us, yeah, good for business." Pettijohn said business was up with news of the season's first freeze. "We were busy this weekend, but you're right, people will come in after work," he said. "People like to burn a fire; 50 degrees, they'll start trying to burn them." Pettijohn said he hopes this is the start of a cold and profitable winter. "We're ready, let it rip," he said. Big John's workers said they hope this winter won't be like last year. In the spring, they still had cords of wood after the warmer winter. "We didn't have no winter at all, so we're really hoping," Pettijohn said. "They're anticipating it's supposed to be a good winter. We had some good cold fronts come through." This current cold front is a chance to make sure residents are ready for the entire season, said Fort Worth Water Department spokeswoman Mary Gugliuzza. "When the pipes freeze, it can create more calls for us," she said. "It leads to loss of water for them, and it's on their side of the meter when those breaks happen, so we're just trying to help folks know what they need to do to get ready." It includes wrapping water pipes that are outside or lack insulation with Styrofoam padding and placing Styrofoam protectors over spigots on the side of the house. "The foam helps with that against the house," Gugliuzza said. Letting a faucet drip keeps pipes from freezing, but the Fort Worth Water Department doesn't recommend it. Gugliuzza said it's a waste of water and money, saying other measures work to keep pipes from freezing. Gugliuzza also said it would take several days in a row of freezing temperatures for city water pipes to have issues and break. Anyone who sees a possible broken water main is urged to immediately call the city. People also shouldn't drive through areas with broken water mains because they might not be able to see holes in the ground.